The Low-Down: If Facebook Can Crush A Rising Star Like Snap, What Does It Bode For Tech? If Facebook Can Crush A Rising Star Like Snap, What Does It Bode For Tech? In today’s social media industry, you have two options: Die young, or live long enough to turn into Facebook. After a disappointing earnings report sent the company’s stock tumbling 20%, Snap announced a strategy shift. Snap’s pivot is an indictment of our current tech landscape, and a warning. If a wildly creative company with an app used by 178 million people every day can still be crushed by Facebook, how is anyone supposed to succeed? In today’s social media industry, you essentially have two options: Die young, or live long enough to turn into Facebook. Snap, the parent company of Snapchat, appears to be headed down the latter path. After a disappointing earnings report last week, which sent the company’s stock tumbling by nearly 20 percent, Snap announced a sweeping strategy shift that contained more than a few hints of Facebook envy. In an attempt to spur user growth, Snap’s chief executive, Evan Spiegel, announced that Snapchat would be redesigned to make it easier to use. The app, which featured a minimalist design that appealed to teenagers while often perplexing their parents, will soon have a personalized feed that uses algorithms to show relevant stories to users, rather than making them sift through a reverse-chronological feed. Twitter made a similar change last year, also under pressure from Facebook. Snap has also revamped its ad-buying process to be more like Facebook’s, with ads that can be purchased through an automated system. And it signaled last week that it wanted to expand its presence in the developing world, where Facebook is dominant. Only about 25 percent of Snapchat’s daily active users live outside North America and Europe, compared with more than 65 percent of Facebook’s users. It’s hard to blame Snap, which declined to comment for this column, for going the Facebook route. Facebook and Instagram, which is owned by Facebook, have been trying to copy Snapchat out of existence for years, and they might be succeeding. Instagram Stories, a near-clone of Snapchat’s most distinctive feature, has reached 300 million daily active users, nearly twice as many as Snapchat. Facebook’s enormous profits have given lofty expectations to investors in other social media companies, and its more than two billion users have made everything else seem small by comparison. But Snap’s pivot is more than a necessary business move. It’s an indictment of our current tech landscape, and a warning sign for other start-ups hoping to take on the largest internet companies on their own terms. If a wildly creative company with an app used by 178 million people every day can still be crushed by Facebook, how is anyone supposed to succeed? Snap still has lots of things going for it. It remains popular among American teenagers, perhaps the most highly coveted marketing demographic in the world. Snapchat has more users in the United States who are 12 to 24 years old than either Facebook or Instagram, according to eMarketer. It has also been able to buck Silicon Valley trends and introduced some truly innovative ideas, like the concept that not all digital communication should be permanently archived. And while Snap is losing money, many of its losses stem from changes it has made in order to compete with Facebook. Still, the fact that Snap’s future is uncertain should worry you, even if you’ve never used its products. A world in which every successful internet platform is expected to behave like Facebook is a more boring, less innovative world, with no companies to challenge Facebook’s vision of the future. It’s not a good sign that in order to survive as a competitor, Snap may have to abandon the qualities that made it different in the first place. Snapchat’s distinctive qualities also helped steer it clear of some problems that are now plaguing its rivals. It appears that Snapchat, unlike Facebook, was never exploited by Russian propagandists to influence an election, and it has taken a responsible approach to preventing false information from appearing on its platform. (Snap’s vice president for content, Nick Bell, recently told Bloomberg Businessweek, “We only work with authoritative and credible media companies, and we unashamedly have a significant team of producers, creators and journalists.”) Snapchat has not been overrun by bots and neo-Nazis, as Twitter has. And unlike Google, Snap has not harvested its users’ data in order to chase them around the internet with spammy ads for diet pills and miracle teas. Snapchat isn’t perfect by any means, and some of the company’s wounds have been self-inflicted. Snap has misled users about its data collection practices in the past, which led to a settlement with the Federal Trade Commission. It spent millions of dollars developing Spectacles, a pair of sunglasses with a built-in Snapchat camera, that everyone talked about but few bought. (Last week, the company wrote off $40 million in losses on the project.) And nobody forced Mr. Spiegel to raise billions of dollars from investors who would demand Facebook-style growth. Billy Gallagher, a former TechCrunch writer whose book on Snap’s corporate history, “How to Turn Down a Billion Dollars,” will come out next year, characterized the company’s recent changes as “death by a thousand paper cuts.” He told me that while investors might appreciate touches like an automated ad-buying system and a more intuitive app, Snapchat’s core users could feel betrayed. “A social network acts against users’ interests when it needs to make money,” he said. Snapchat, Mr. Gallagher writes, was never supposed to be just a photo-sharing app. It was the embodiment of Mr. Spiegel’s worldview about how the internet should work — temporary instead of permanent, private instead of public, candid instead of rehearsed. I asked Mr. Gallagher why Snap needed to compromise its values in pursuit of Facebook-style growth. Couldn’t it reject Wall Street’s demands, concentrate on making its existing users happy and be satisfied as a smaller and more focused company? 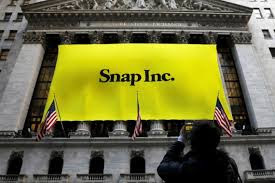 Mr. Gallagher said Snap’s employees, many of whom joined because they believed that the company would grow to enormous size, might bristle at any strategy that would hurt the value of their stock options. And he pointed out that Mr. Spiegel, a grandiose 27-year-old who reportedly keeps a portrait of Steve Jobs on a wall of his office, might not be satisfied with merely modest success. Last week, Mr. Spiegel pledged to keep Snap’s core values intact while expanding its business. But growth often comes at the expense of experimentation, and Snap’s decision to become more like Facebook is a worrisome sign for people who care about preserving the internet’s quirky heterogeneity. Snapchat’s users were once offered something genuinely different, but it may be time for them to expect more of the same.